Lauren Bell, 23, does not have a single memory from before the age of nine. Her earliest memory is of coming home from school with her dad, pulling into the driveway and a stranger opening the front door. The next thing she knew her dad was whisked inside, and she and her elder brother Matthew, 11, were taken to a neighbour's house. That morning her mother had been stabbed 50 times as she sat behind the wheel of her car in a swimming pool car park. 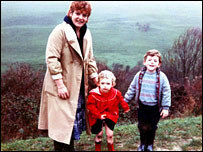 That was 14 years ago, and still no one has been convicted of the murder of 43-year-old Penny Bell on 6 June, 1991. Earlier this month, police offered a £15,000 reward for information to help catch her killer. For Lauren, a customer services manager for Fiat cars from Tylers Green, near High Wycombe, this development holds huge significance. "It means absolutely everything," she said. 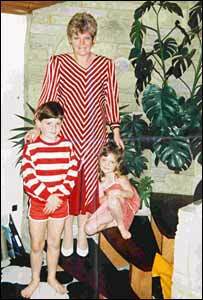 "I could not wish for anything more than to see my mum's murderer convicted. "Until that happens none of the family will be able to move on with our lives. It's 14 years on now and we have to know." Penny Bell was a woman who juggled family life with her company, a catering recruitment agency which she ran with her business partner. "I do not remember my mum at all," said Lauren. "Everything I know about her is from what my dad has told me - it is not a lot. From all accounts though, she was incredible." At the time of her death, Penny Bell was in the throes of some major building work to the family home in Denham, Bucks. That morning, she told builders she was running late for an appointment as she dashed out at 0940 BST. Two hours and 20 minutes later, police officers found her body slumped in the driver's seat of her Jaguar XJS in Gurnell Grove swimming pool car park, in Greenford, west London. There were design samples for the bedroom laid out across the back of the car as though displayed for viewing or discussion and £8,500 had earlier been withdrawn from her and her husband's joint bank account. That was the day that wiped out Lauren's memory, destroyed her family's life forever and bothered a generation of detectives. "To this day, people still say he did it," Lauren says of her father, now 56, who still lives in their family home. "It's heartbreaking. Losing my mum has ruined his life." In 1992, a man named John Richmond who had moved in similar social circles as the family, sold a story to the Sun newspaper, saying he had been with Penny Bell the morning of her death. Police at the time arrested Mr Richmond who was released without charge. They worked on the case for eight years before it was "put away" unsolved. It was to be another three years before a team of retired police officers recommended the case was re-examined by the murder review team in 2002. Det Ch Insp Dave Little, who has now taken on the case, said: "John Richmond was arrested and spoken to originally but no evidence was found to incriminate him. "I would appeal to anyone who may have not come forward through whatever allegiances they had at the time, who may have since had a change of heart." For Lauren, it seems cruel and incredible that on that one morning in a leisure centre car park in 1991, there was not a single person who could tell her who killed her mother. "I'm never going to get my mum back but I just want to know who it was."